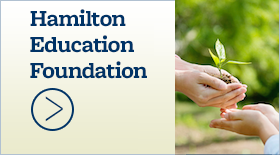 May 1, 2018 - Hamilton School District. 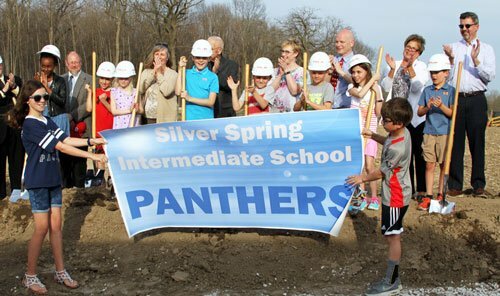 The Hamilton School Board accepted the recommendation from an online survey and chose Panthers as the mascot for Silver Spring Intermediate School. After elementary students narrowed down the options to Panthers, Lightning and Sharks, district families overwhelmingly voted for Panthers in an online survey. The online survey results were announced at the groundbreaking ceremonies prior to the meeting, and the School Board took action to make it official. A process for filling the Butler position on the School Board was approved. Deborah Briggs, who served in that capacity for 24 years, chose not to seek re-election this year and no other Butler citizens ran for the position. Similar to the process that was used two years ago when James Long moved from the district and was no longer able to serve on the School Board, Butler residents will have an opportunity to submit a letter of application to serve on the board. Current School Board members will then interview applicants. Hamilton High School Associate Principal and Extended Learning Opportunities Coordinator Mark Otto presented three items to the School Board. 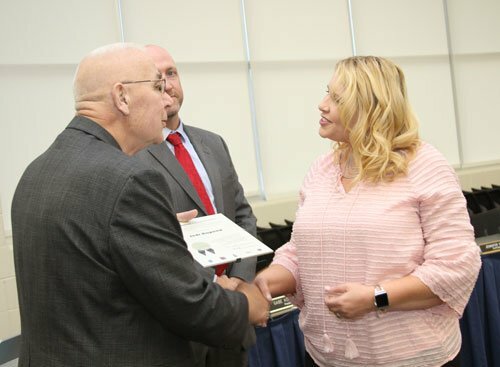 The School Board approved continued participation in the Carl Perkins grant consortium offered through CESA #1 which provides the district with $13,934 in grant funding this year, a reduction from $15,091 the previous year. The purpose of the grant is to provide students with academic and technical skills to succeed in a knowledge- and skills-based economy. It supports career and technical education that prepares students for postsecondary education and careers. The consortium provides grant-writing management, interaction with professionals from other districts, exposure to what is occurring at state and national levels and consultation services. The district’s Extended Learning Opportunities Program annual report was accepted. The program grew out of the school-to-work initiative that aimed to connect education and employment where 4-year college degrees were not required. Experiences in the program include apprenticeships, mentorships, internships and job shadowing. The program strengthens partnerships with the business community to prepare students for the world of work, regardless of the education or career track they choose. Beginning in July, the Early College Credit Program will replace Youth Options for students interested in taking postsecondary course at universities. Start College Now will replace course options and allow students to take postsecondary courses at Wisconsin technical colleges. Participation in the Waukesha County School-to-Work consortium for 2018-19 was approved. The School-to-Work Consortium provides grant funding that supports co-op, youth apprenticeship, work experience programs and K-12 career-related initiatives. 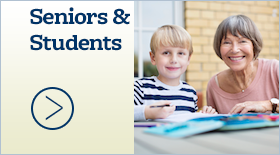 Participation in the consortium is voluntary and provided at no cost to the district. 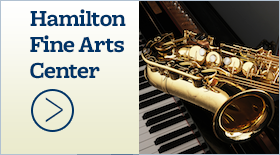 Summer workshops for teachers were authorized. The action allows teachers to participate in curriculum and professional development workshops focused on district initiatives. Curriculum and professional development projects will focus on analytic reading rubric development, mathematics standards transition, science resource training and preparation, science rubric development, professional reading, Chromebook use, instructional practices, science cross-cutting concepts, science assessment task alignment, formative writing assessment development, process standards academic vocabulary and new teacher orientation. 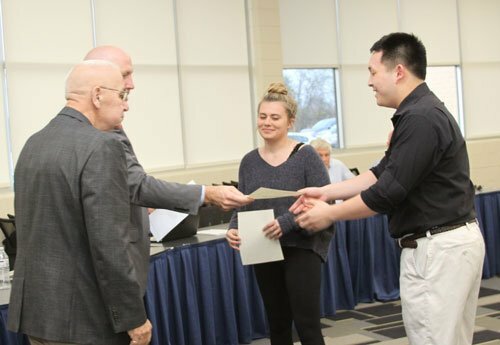 Hamilton seniors Elyse Eckert and Andrew Tai were recognized for being named finalists in the National Merit Scholarship Competition. Seniors Alan Chen and Matthew Gnanadass, who are also finalists, were not able to attend the meeting. Willow Springs staff members Renae MacCudden, Michele Luebke, Lynn Richmond, Rheann Jacobs, Stephanie Christofferson and Lori Konshak described the outstanding service of five senior citizen volunteers. 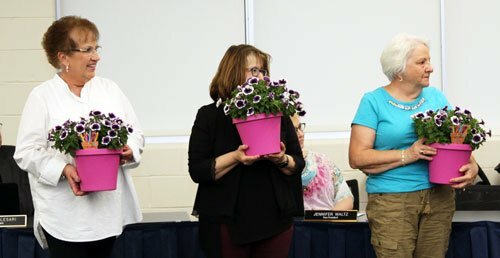 Gayrene Chambers, Barb Vitrano and Sue Howard, who attended the meeting, along with Avis Dallman and Diane Wunch, who were not present, were recognized for their commitment to Willow Springs students and staff. Woodside Elementary School technology integration resource teacher Jodi Rupnow was recognized for being selected as the 2017-18 Milwaukee Symphony Orchestra’s Arts in Community Education Teacher of the Year. The district’s instructional coaching team of Cathy Drago, Patricia Sankey, Addie Starrett, Kim Weber, Anne Hatfield and Pam Welter provided an update on the program that was approved in June 2016. The instructional coaches described how they work with teachers to help students make gains. 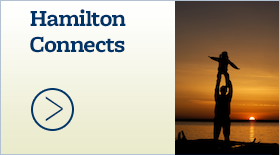 Hamilton’s instructional coaching model was designed to provide job-embedded professional development and support in an effort to enhance student learning. Instructional coaches work with teachers to help incorporate research-based instruction into teaching, identify professional goals and implement a plan to reach them. School Board members elected Gabe Kolesari as their president, Jennifer Waltz as vice president, Dawn Van Aacken as clerk and Jay Jones as treasurer. appointed Sarah Akin as a Woodside associate kitchen employee, effective April 20, Kirstin Seizer as a Templeton special education teacher, effective Aug. 22, Abigail Kesler as a Hamilton special education teacher, effective Aug. 22.